BACKGROUND: The global demand for diagnostic imaging exceeds the supply of radiologists and is of particular significance in poorly resourced healthcare environments where many radiographs are unreported. Delayed or absent reporting may negatively impact patient management. In well-resourced countries there is recognition that extending the role of radiographers to radiological reporting tasks helps meet service demands. AIM: To determine the accuracy of acute fracture detection by South African radiographers working in an after-hour setting. METHOD: We performed a retrospective study of radiographers at a Western Cape Regional Hospital over 2 months in 2011. The sensitivity and specificity of radiographers' fracture detection were compared with that of a consultant radiologist. Differences were evaluated using the McNemar chi-squared test, with p<0.05 regarded as significant. RESULTS: A total of 369 radiographs were analysed. The overall accuracy of reporting by radiographers was 93.7%, with 74.4% sensitivity for fracture detection. Experienced radiographers performed better than inexperienced radiographers; adult fractures were more consistently identified than paediatric fractures, and appendicular fractures were better visualised than axial fractures. In all instances there was a significant difference between fracture detection by radiographers and the radiologist. Experienced radiographers evaluating appendicular fractures in adults achieved the highest sensitivity (89.9%), which was not significantly different from that of a consultant radiologist (p=0.88). CONCLUSION: The performance of experienced radiographers in our study is comparable with that of experienced radiographers internationally, who have no specific training in trauma radiograph reporting. However, additional training is required if role extension is to be considered. The burgeoning global demand for diagnostic imaging services exceeds the supply of radiologists. Since radiologists devote their time to more sophisticated imaging investigations, such as computed tomography and magnetic resonance imaging, many plain radiographs are not reported. Delayed or absent plain radiograph reporting may negatively influence patient care and clinical management. [2,3] While the effect of the global shortage of qualified radiologists has been documented in well-resourced countries,[1,4] it has potentially greater significance in the public sector in low- and middle-income countries. The 'red dot' system has been used in the United Kingdom (UK) since the mid-1980s. Radiographers place a small red sticker on any trauma radiograph demonstrating a fracture, alerting the emergency-unit clinician to the presence of an abnormality. Involvement of UK radiographers in plain-film reporting in the past 2 decades has increased the volume of reporting and decreased report 'turn-around' time. Experienced UK radiographers who received supplementary training in skeletal-trauma radiology significantly improved their diagnostic skills and reported such radiographs with a high degree of accuracy. Furthermore, a UK-based meta-analysis showed that the accuracy of selected plain radiograph reporting by specifically trained radiographers was comparable with that of consultant radiologists. The reporting of radiographs is not in the current scope of practice of South African (SA) radiographers. To the best of our knowledge, there has been no study of the accuracy of SA radiographers utilising the 'red dot' system for trauma triage. Such a study is important. If SA radiographers can be shown to accurately identify trauma pathology, the profession has the potential to make a considerable contribution to service pressures at regional and district public sector hospitals, where there is limited radiologist cover, particularly in the after-hours setting. This would also provide a compelling argument for formal extension of the scope of practice of SA radiographers. Our study was based at Worcester Provincial Hospital (WPH), a 269-bed regional hospital serving the urban and rural communities of the Boland in the Western Cape Province of SA. The hospital is a referral centre for 6 district hospitals and serves a population of approximately 1 million people. It has a busy emergency unit staffed by medical officers. The hospital has consultant radiologist cover during normal working hours only, with 6 full-time and 3 community-service radiographers. The more experienced full-time radiographers have at least 5 years of post-qualification experience. The 'red dot' system for the triage of trauma radiographs has been operating in the after-hours setting at WPH since 1988. We performed a retrospective study of after-hours acute trauma studies performed at WPH during March and April 2011. We reviewed the emergency unit records of the radiology register, which is used to record patient name, age, date of birth, gender, hospital number, clinical details, imaging study requested, examination date and time, and the radiographer performing the study. After-hours acute trauma studies' were defined as all acute trauma-related radiographs performed on weekends and outside 08h00 -16h00 on weekdays. Radiographs meeting the inclusion criteria were retrieved from the archive of the radiology department and reviewed by a consultant radiologist. We recorded clinical data and radiological findings, including the presence of fractures and 'red dots'. To determine the accuracy of radiographer reporting, the presence or absence of a 'red dot' was correlated with the consultant radiologist's report of the presence or absence of a fracture in each case; the latter regarded as the 'gold standard'. The sensitivity and specificity of fracture detection were reported with 95% confidence intervals and the McNemar test was used to assess the difference between radiographer and radiologist detection rates. A p-value <0.05 was regarded as significant. Subgroup analyses were used to correlate fracture detection with fracture location, patient age and radiographer experience. The study was approved by the Stellenbosch University Health Research Ethics Committee (ref no. N11/03/086) and the Chief Executive Officer (CEO) of WPH. Between March and April 2011, 381 trauma radiographs were performed; 369 (96.9%) could be retrieved for analysis. The examinations were performed on 254 patients with a median age of 30 years (Table 1). More than two-thirds of the radiographs (n=253, 68.0%) involved the appendicular skeleton and just over one-half were performed by experienced radiographers (n=206, 55.8%). Radiographers correctly interpreted the findings in 346 cases (an overall accuracy of 93.7%). Fractures were identified on 86 (23.1%) radiographs; most involved the appendicular skeleton (75/86, 87.2%). 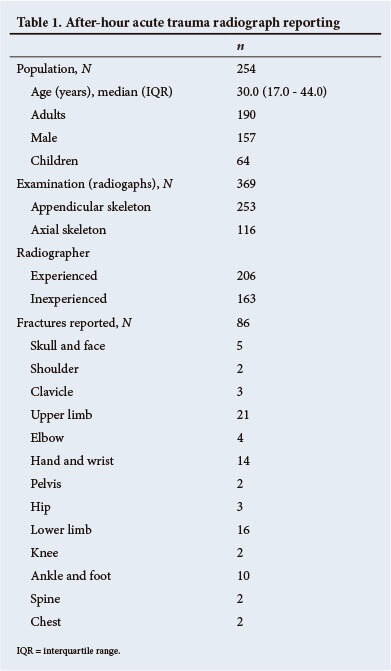 Radiographers identified 64 fractures, with an overall sensitivity of 74.4%. The McNemar test showed a significant difference between radiographers and the radiologist in overall fracture identification (p<0.0001) (Table 2). Subgroup analyses showed that fracture detection by experienced radiographers was better than that of inexperienced radiographers (82.0% v. 63.9%, respectively); adult fractures were more consistently identified than paediatric fractures (77.4% v. 63.1%, respectively), and appendicular fracture detection was superior to that of the axial skeleton (76.0% v. 57.1%, respectively). There was a significant difference between the fracture detection by radiographers and the radiologist for all patient subgroups (p<0.05 in all cases) (Table 2). 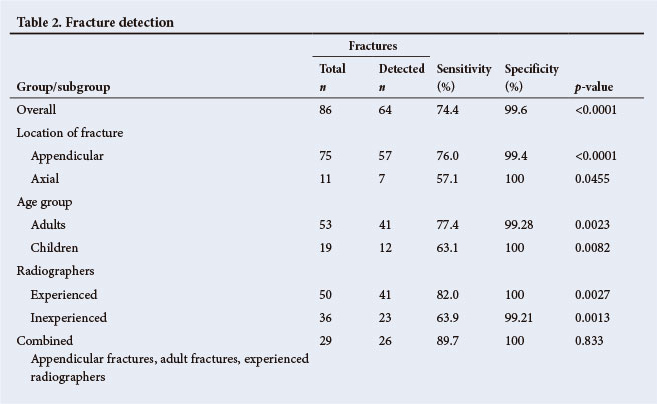 The highest sensitivity for fracture detection (26 of 29, 89.7%) was achieved when experienced radiographers reported fractures of the appendicular skeleton in adults. For this subgroup there was no significant difference between radiographers and the radiologist (p=0.833). To our knowledge, this is the first study of its kind in SA and the first to be conducted in a resource-limited healthcare environment. Consequently, it provides an important contribution to the discourse on the role of radiographers in reporting trauma radiographs. The overall accuracy of regional hospital trauma radiograph reporting by our cohort of radiographers is slightly higher than that achieved by UK radiographers who had no specific training in trauma reporting (93.7% v. 90.6%, respectively). Similarly, experienced WPH radiographers have an overall fracture-detection sensitivity similar to experienced UK radiographers who had no additional training in trauma radiograph interpretation (82.0% v. 81.1%, respectively). This suggests that the trauma-triage performance of SA radiographers who have had no specific additional training is consistent with international norms. There is international consensus that fracture-detection sensitivity in the order of 95% is required if radiographers are to fulfil a formal clinical role in trauma reporting. Although our study showed no statistically significant difference between experienced radiographers and the radiologist in the reporting of adult fractures of the appendicular skeleton, the sensitivity achieved (89.7%) represents an unacceptably high rate of error,[8,9] with non-detection of 1/10 fractures. Loughran showed that training improved the sensitivity of radiographer fracture detection by approximately 15%, from 81.1% to 95.9%; notably similar to that of a radiologist (96.8%). Furthermore, Coleman and Piper showed that the trauma reporting of UK radiographers was significantly better than that of casualty officers. No study on the accuracy of trauma radiograph interpretation by SA medical officers exists. If experienced SA radiographers are shown to be superior to medical officers in the interpretation of radiographs, investment in public sector radiographer training for the purposes of role extension may well be justified. Our study was limited by retrospective data acquisition, although over 90% of films were retrieved for reporting. Further limitations included: (i) a relatively small sample size; (ii) the radiologists not being blinded to the radiographers' findings; and (iii) an assumption of 100% accuracy for radiologist reporting. The latter limitations may have introduced negative bias into the reported radiographer detection rates. The accuracy of fracture detection by SA radiographers who have no specific training in trauma radiograph reporting is comparable with that of international radiographers of similar experience. Additional training is required if SA radiographers are to fulfil a formal clinical role in trauma radiograph reporting. Acknowledgements. We thank Dr H Schumann, CEO of WPH for granting permission for the study; Dr Justin Harvey of the Centre for Statistical Consultation, Stellenbosch University for statistical analyses; and Ms Sue-Ellen Baxter of the WPH Radiology Department for the retrieval of radiographs and related demographic data.